Whether you’re flying, driving, or taking the train back home for the holidays, traveling during this time of year can go from charming to stressful at the drop of a hat (or, you know, a snowflake). Your first line of defense against mid-journey setbacks? An outfit that looks like a million bucks but feels like a dream, and a bag packed with everything you need to cope with drama. You know, other than mimosas. Here, are recommendations for both. Get your fit and your kit together now and you’ll practically float from point A to point B when the time comes to migrate back home. Whether you’re a jeans-and-boots girl or a leggings-and-sneakers girl, we can all agree that a comfy top is essential for traveling. Our sweatshirts are beyond perfect for a day on the road. Tailored to be a little sexier and more interesting than your average pullover, and yet just as comfortable, they’re everything you need in a longest-day-ever top. Topping your outfit off with a chic belt bag is the ultimate travel hack. 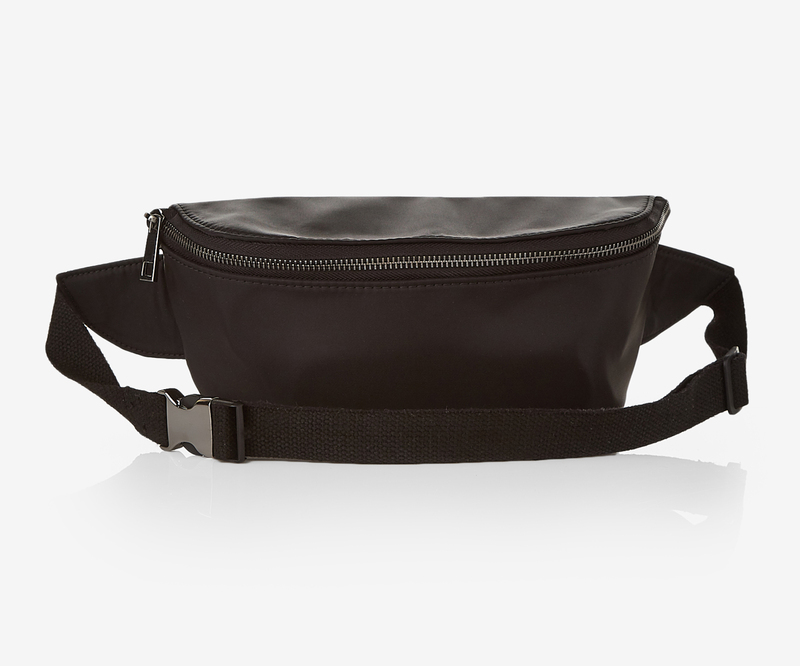 Not only does it give your comfy-cool look a little high-fashion edge, but it allows you to keep your essentials at the ready so you can zip through lines faster. Fill it with your cell phone, ID, credit cards, and headphones and you’ll be the warrior of every rest stop and security line—a really well-dressed one at that. Once you’ve got your travel look together, it’s time to build the perfect on-the-go bag. Pack a few accessories that will take your outfit from comfy to luxurious, like slippers or cozy socks and a big blanket scarf. A silk sleep mask will allow you to get some shut-eye when the time is right—and still look cute should your travel companion decide to Snapchat your cat nap. When you wake up, you’re going to need a mid-trip refresh. A chic zippered pouch packed with a few beauty essentials—like velvet holders to pull your hair into a cute high pony, and some cucumber toning mist for a fresh complexion—will save your look from going downhill during the day. And don’t forget to hydrate, ladies. A cute travel thermos filled with water will remind you to drink and refill throughout the day. Make a deal with yourself: if you drink a couple of liters of water during your trip, you can enjoy a glass of wine or hot chocolate the size of your face when you arrive at your destination. You’ll have more than earned it, friend. Have your own favorite Express travel essential? Share your hack with us at @express on Instagram using #ExpressLife. See you on the road.